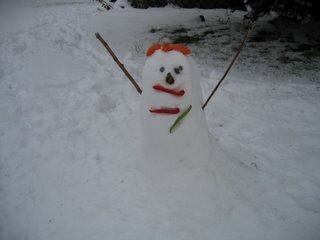 My kids made this snowman or snowbaby as they call it last weekend. They kept asking me for various items for the eyes, lips, etc. Since I didn't have any carrot sticks, I gave them red peppers, green beans, and orange peels. They used little rocks for the eyes and nose.